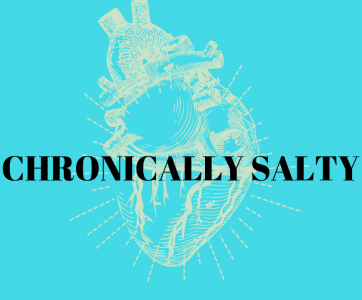 Interested in being featured on Chronically Salty? Chronically Salty is a platform for people with chronic illness to find tips, tricks, and support for living with chronic illness. These are free submissions: you would not be paid for your article. However, your article could help lots of fellow spoonies! Articles will be edited before publication. What kind of articles are on Chronically Salty? Focused articles on a particular barrier a chronic illness has made for you and what tips/tricks you use to overcome it. (see my article on heat intolerance with POTS). Articles about programs and support groups you personally manage or help manage that could help others. (see the guest article for chronic pain support groups). Articles that address stigma faced by those with chronic illness and ways that you positively deal with them. These should be confidence-building and help individuals with feelings of shame, anxiety, etc, around these stigmas. (See my article on mobility aides). All articles max 1200 words– original artwork or images welcomed! After publication, you can ask for articles to be removed from the site at any time and you are also free to publish elsewhere as well–just notify me for other submissions so I can provide links on the site to those publications. As I do have a chronic illness as well, I only have so much energy for blogging, so submissions may take some time to be published and some may not be able to be published, depending on the work load. Still interested? Or have a topic you would be interested in reading about but don’t want to write?